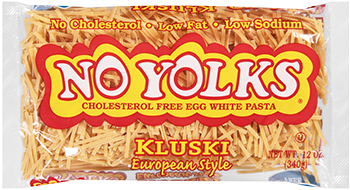 1/8" wide and twice as thick as other cuts, our Kluski Noodles offer the same great No Yolks® taste in a smaller but thicker cut that is perfect for traditional European dishes. Available in 8 and 12 oz. 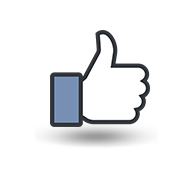 DURUM WHEAT FLOUR, CORN FLOUR, DRIED EGG WHITE, NIACIN, FERROUS SULFATE (IRON), THIAMIN MONONITRATE, RIBOFLAVIN, FOLIC ACID. 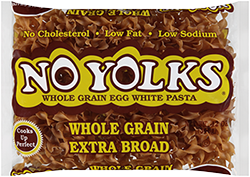 Firm and fluffy with 45g of whole grains per serving!